For ease of travel by car over the last year or so we’ve been holidaying in North Wales. Cinabar and I usually go away for a week somewhere in April, then to Alton Towers and London (to see a show) for a week away on my Birthday in July, and then three days in November. For the three days this year we were going to be exploring Seahouses in Northumberland, as well as Alnwick Castle and Bamburgh Castle, and generally have a poke around the north coast. Cinabar was desperate to stay in a big spooky castle whilst we were there, so she booked Lumley Castle for two nights. We then found out that Alnwick and Bamburgh Castles are both shut in November. Cinabar found a ship in Hartlepool called the Trincomalee that had fought in Trafalgar and had recently been refurbished from a Naval training ship to the way it looked when it sailed the seven seas ready for battle in 1817 (“Ha, ha… me Hearties! Shiver me timbers! Yo ho ho and a bottle of...” Okay, okay… I’ll stop). After lunch on the way and getting lost a couple of times, we arrived at the ship’s museum at 3pm. We saw this Wassail ale in the shop, but didn’t manage to buy it before the place closed. We did have a great time wondering around the beautifully refurbished ship though. We also had a good wonder around the docks and saw the rather rough looking North Sea from the harbour walls as the sun went down. We then drove to Cinabar’s spooky sounding Lumley Castle. We heard several ghost stories from the staff that night, including a Cavalier who sits amongst the guests in the lounge area, and how a staff member had been scared half to death in one bedroom by a cold wind and a figure sitting on the end of the bed waking her up in the night. After a tasty, but expensive meal we had a good wonder around the haunted castle. Every picture, ancient bust and statue seems to stare at you with soulless eyes that follow you where ever you are in the room. Before bed we looked at the map and decided to explore Hadrian’s Wall the next day. Over the next two days we visited three Roman forts; Chester Fort, Vindolanda, and Housesteads, which were all fascinating to wonder around. 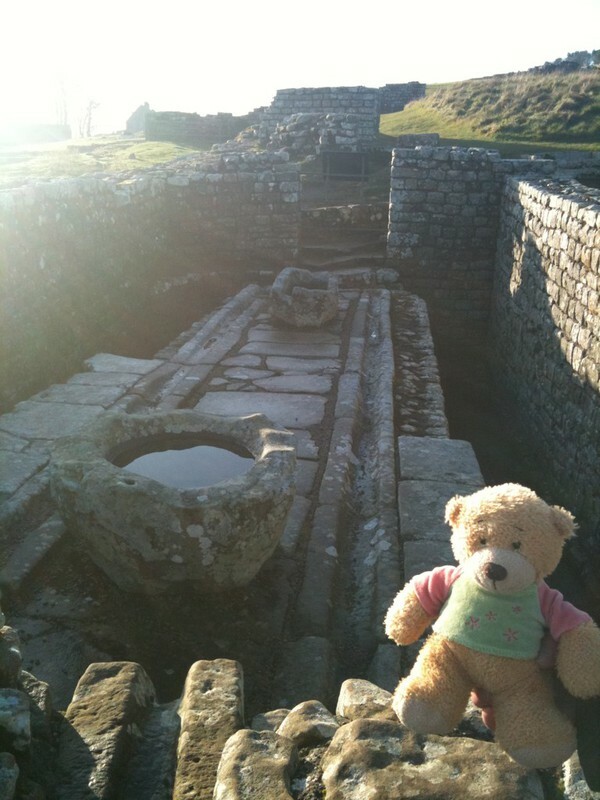 Chester Fort had a well preserved Roman Bath House, whilst Housesteads had a very well preserved latrine (see above!) and we had a race jumping across the stones of the pillared floor in the Grain Store. We saw this Wassail ale again at Chester Fort and snapped it up straight away this time. Made by Ballards Brewery for the English Heritage, this 6% volume beer sports itself as a “full bodied fruity beer with an underlying hoppiness.” It says on the label that it’s brewed with the finest malts and barley. On opening I noticed the strong barley smell straight away. The barley smell transcends to the taste giving this beer a sturdy barley flavour with a wheaty musky taste to it. The quality of the beer certainly doesn’t disappoint the taste buds. This is a good beer to drink late at night in a spooky castle to warm your shaking bones or failing that crack open a few whilst watching a good epic movie.